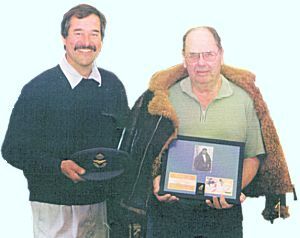 Irvin Flying Jacket Reunited with Wartime Owner! The fun of this business is not just the excitement of what we will find next, but also the "living history" of the people involved. 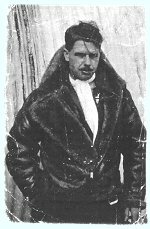 A case in point resulting from research we have been carrying out on a wartime "Irvin" flying jacket which we have in stock and was bought with a crumpled picture of the original owner - one Warrant Officer (W/O) J.R. Bristow. The only other information we had on him was a copy of his "Goldfish Club" certificate which was issued to him on the 21st November 1944. The Goldfish Club, formed in 1942 by the manufacturers of the rubber dinghies supplied to the RAF, is open to any aviators who have had the misfortune to ditch in the sea and survive! In the hope of finding out about the jacket's previous owner, I contacted the Club's secretary, one Roy Graham - just in case he had some information on W/O Bristow. Two days later I took a phone call with the opening words: "you don't know me but you know of me!" I could hardly believe I was actually talking to John Bristow himself - and more amazingly he lives not twenty miles from our office! Unlike many veterans, John was more than happy to talk about his wartime career (Coastal Command flying Halifax aircraft with 518 Squadron out of Tiree in Scotland on meteorlogical duties) and in particular, the full story behind his "Goldfish Club" membership. John, a spritely 80 year old, offered to drive over to our office and we waited with some excitement to meet the following week. He duly arrived . . . for a navigator who in a previous life flew 10 hour missions out and back over the North Atlantic, this was not an issue! Our meeting lasted the full morning and the events of that day back in the dark winter of 1944 were brought graphically to life. Not only is his memory of these times absolutely clear, but he also had original photographs of his ditching and subsequent rescue as well as his log books and of course his coveted Goldfish Badge and certificate. I was pleased to reunite W/O Bristow with his Irvin jacket and his parachute bag emblazoned with his name. I am also delighted we encouraged him to write down, for the first time, a report of his ditching and rescue which he has kindly allowed me to publish and illustrate with some of the unique photographs. What amazes me now, looking back at the black and white images of these young men nearly 60 years ago is their amazing bravery, and in many cases the ultimate sacrifice, in the face of the Nazi threat. While meteorlogical flights out into the Atlantic may not have had the glamour of the fighter boys or of bomber command, the job they did had far reaching influences on the course and outcome of the war. John recounted a Met. flight they performed which directly affected the date and timings of the D Day Landings and we hope to publish a further report on this crucial mission in due course.